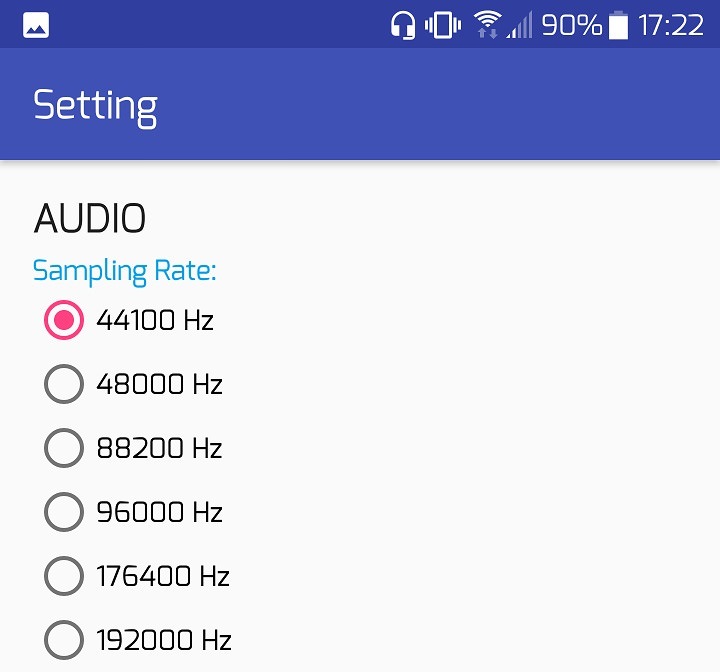 Beginning from Android 6.0, audio sampling rates like 96 kHz, 192 kHz are supported. High quality 96 kHz music can be played. High quality 96 kHz audio can be recorded. However, the hardware limitations reduce the benefits of those high sampling rate. Digital signals --> Digital-to-Analog (DAC) --> Op-amp --> Speaker or headphone jack. Modern DAC does supports high sampling rates. There is no problem. But the speaker, especially the built-in speaker for phones, is very unlikely to support more than 22 kHz. Again, the microphone is normally designed to work below 20 kHz. I have tested all my phones, the highest frequency which can be detected and decoded is around 21 kHz. Therefore, the headphone jack seems to be the only chance for high frequency. But I don't found any report about the ability of headphone input. If you have the related experience, please share with us. The sampling rates are detected automatically. If an option is not supported by the device, it will be disabled. The setting is applied to all audio features except the plugin. Input and output use the same sampling rate. No matter the device's hardware supports high sampling rate or not, MCA Pro supports sampling rate up to 192 kHz. All UIs are also modified to support varies sampling rates. I need to use SSPWM for 3 output but not at the same time. I am not familiar with SSPWM. 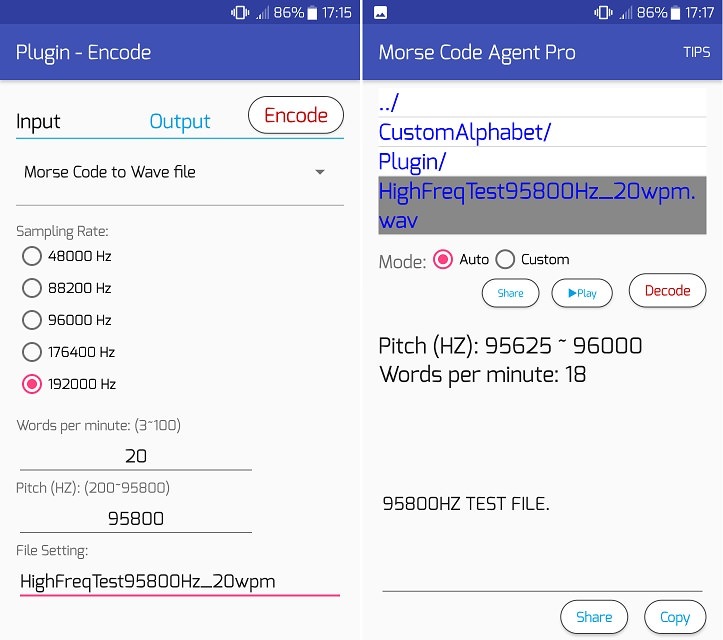 Do you want to output 3 Morse code with different pitches sequentially? 2 kHz output? By devices. For my phone (HTC 10), it can output 2 kHz sound but with the small amplitude. If you are asking for 150C to print ABS, you only need 110C, or perhaps Im misreading your question?